Wikinomics – Time banking: The currency of the social world? I recently had a look at time banking models in the UK. Without covering the different concepts and applications of time baking, here’s the idea in a nutshell: People receive time credits for voluntary and community activities, instead of receiving money or no reward at all. So for hour of activity, one receives one time credit. One principle of time banking is equality, it makes no difference if a doctor or a homeless person performs tasks to earn credits – every activity has the same time credit value. Time credits can then be exchanged for services from other time bank members, for services of community organizations, or leisure activities like free entrance to a theatre show. A local organization organizes and facilitates the exchange. 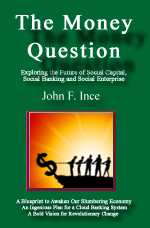 via Wikinomics – Time banking: The currency of the social world?.